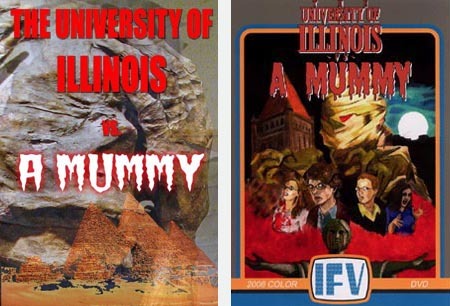 Among several interesting tidbits tossed on the table during Tuesday night’s Champaign Movie Makers meeting, C-U Blogfidential learned from THE TRANSIENT director Chris Lukeman that Amazon.com now offers for sale his prior full-length effort, THE UNIVERSITY OF ILLINOIS VS. A MUMMY. “Groovy,” said your humble editor, and upon further Internet inspection he discovered that Lukeman landed the retail opportunity with help from a CD/DVD distributor called Sonic Wave International that has roots in Bloomington, Arlington Heights, or Oak Park, IL, depending on where one looks. A graphics-heavy Web site for Sonic Wave features a product line dominated by rock, metal, rap, and rhythm-and-blues albums, with a tiny DVD selection consisting mostly of hip-hop and Indian (!) music videos and concerts, so the addition of MUMMY to their catalog is curious. Also worth a raise of the eyebrow is the inference that some or all of these releases are “manufactured on demand using DVD-R recordable media” as is stated on the Amazon page for MUMMY. We’re crossing our fingers that Lukeman could justify signing with Sonic Wave, exposure being the most likely benefit for both the movie and the Illini Film & Video student club. Of course, convincing consumers to spring for this MUMMY is a different story, so I question Sonic Wave’s decision to jack the price so high – $17.99 on Amazon for a DVD-R? Seriously? – while saddling it with even more questionable cover design. Calling it “design” is actually being too kind. Are you ready to witness the horror? Above left is the appalling new image that will greet consumers. I would really like to know what possessed their artist to combine such bland typography with stock images of a real mummy and real pyramids. It looks slapdash in the worst bargain-bin way and completely ignores the charm of the movie. Above right is the appealing original image by Nancy Parman and Marty Sweeney. While certainly no great shakes in its overall technique, the concept and composition are solid enough that Sonic Wave could have requested a refined illustration from Lukeman or spent a little time improving upon it themselves using production stills as a guide. I can speak about this particular aspect of movie promotion from experience. A little-known fact is that I’ve created a handful of video covers over the years, including ones for the student ghost film TRIAD by UIUC/IFV alumnus Chris Folkens and two Synapse Films releases, BACCHANALES SEXUALES and NIGHT TRAIN. My token VHS job, for the Salt City Home Video release FATAL EXAM, involved logo design and a watercolor/gouache illustration of a skull-headed, scythe-wielding Death hovering over co-eds in a classroom which, in classic exploitation fashion, never actually appears in the movie. Regardless, my work on FATAL EXAM hits a vibe closest to Parman and Sweeney’s MUMMY packaging, which I find amusing in its nod to the oversized VHS box art of indie horror labels from the Eighties. In comparison, there is no joy in Sonic Wave’s effort. How sad. This entry was posted on Saturday, December 20th, 2008 at 1:49 pm	and is filed under Student Film, Videos du C-U. You can follow any responses to this entry through the RSS 2.0 feed. Both comments and pings are currently closed.